Winners of fancy dress competition posing for a group photograph at Jammu Sanskriti School in Jammu on Friday. JAMMU, Sept 18: Jammu Sanskriti School organized a fancy dress competition Theme “Helpers” for class –I and class –II. The purpose of the competition was not only to blend learning with fun but also to develop confidence in students by giving each student an opportunity to get on stage and speak in front of audience. The students were free to chose their own character and were judged according to attire, presentation and confidence. 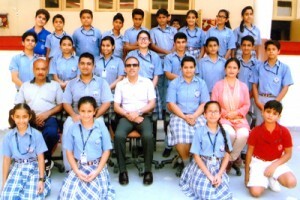 The students of Class – I Arshiya, Hargjot Singh, Aryan Baboria and Harshveer Singh bagged first prize, while 2nd prize winners were Hargun Kour, Kamalshi, Charvi, Shivanshi and Jashmeet Kour and the 3rd prize was claimed by Sumaira, Sarish, Vansh and Janvi. From Class 2nd, the first prize winners were Aayushi, Vasu, Daksh, Abhishek, while the 2nd prize winners were Aadhya, Shriya, Japji, Dhruv and the 3rd prize went to Ridhika, Priyal, Sanidhya, Pradhum, Gangandeep Singh, Naitik. School Principal, Rohini Aima lauded the efforts of the students for their good show.